The Short Line Express Market Gambler Shootout at the Strip at Las Vegas Motor Speedway this weekend marks the conclusion of both the divisional and regional levels of competition in the 2014 NHRA Lucas Oil Drag Racing Series. Lucas Oil Series Division and Regional Championships will be finalized in not only the Pacific Division but in the six other NHRA divisions across the country. The event is one of 44 scheduled across the country where drivers earn points leading to divisional, regional and national championships as well as a chance at a share of the year-end purse of more than $519,000. The event will feature drivers in eleven categories, including 260 mph Top Alcohol Dragster and Top Alcohol Funny Car as well as the Pacific Division Top Sportsman Series, Top Dragster Series, Sportsman Motorcycle Series presented by Harley-Davidson and the NHRA Harley-Davidson Drag Racing Series featuring the Top Fuel Harley class. Gates at The Strip at Las Vegas Motor Speedway open at 7 a.m. each day. Qualifying and time trials start Thursday morning at 8 a.m. and continue Friday at 8 a.m. Top Dragster, Comp Eliminator and Top Sportsman qualify on Thursday at 3 p.m. and Friday at 10:30 a.m. and 4 p.m. Top Dragster, Comp Eliminator and Top Sportsman start eliminations at Saturday at 1:30 p.m. The K&N Top Qualifier Shootout is Friday at 1 .m. Harley series qualify at 3:45 p.m. on Friday and 12:45 and 4:45 p.m. on Saturday. Eliminations start Saturday at 8 a.m. and continue Sunday morning at 8:30 a.m. Top Alcohol Dragster, Top Alcohol Funny Car and Top Fuel Harley will run first round eliminations at 11 a.m. on Sunday. Tickets for the NHRA Lucas Oil Drag Racing Series event at The Strip at Las Vegas Motor Speedway are $20 Friday, $20 Saturday and $20 Sunday. Children 6-12 years old are $5 each day and children 5 and under are free with a paid adult. The Strip at Las Vegas Motor Speedway is located on Speedway Blvd, exit 54 off interstate 15. For more information call the track, (800) 644-4444, or visit www.LVMS.com. WHAT: NHRA Lucas Oil Drag Racing Series Short Line Express Market Gambler Shootout, the last of six events in Pacific Division competition where drivers earn points leading to divisional, regional and national championships as well as a chance at a share of the year-end purse of more than $519,000. Categories include Top Alcohol Dragster, Top Alcohol Funny Car, Comp Eliminator, Super Stock, Stock Eliminator, Super Comp, Super Gas and Super Street. The Pacific Division Top Sportsman Series, Top Dragster Series and Sportsman Motorcycle Series presented by Harley-Davidson will also run in conjunction with the event along with the new NHRA Harley-Davidson Drag Racing Series featuring Top Fuel Harley. WHERE: The Strip at Las Vegas Motor Speedway, Las Vegas. Track is located on Speedway Blvd, exit 54 off Interstate 15. THURSDAY, Nov. 6 - Gates open at 7 a.m. Qualifying and time trials begin at 8 a.m. Top Dragster, Comp Eliminator, and Top Sportsman qualify at 3 p.m.
FRIDAY, Nov. 7 - Gates open at 7 a.m. Qualifying and time trials begin at 8 a.m. Top Dragster, Comp Eliminator and Top Sportsman qualify at 10:30 a.m. and 4 p.m. Top Alcohol Dragster and Top Alcohol Funny Car qualify at 3 p.m. K&N Top Qualifier Shootout is at 1 p.m. Harley series qualify at 3:45 p.m.
SATURDAY, Nov. 8 - Gates open at 7 a.m. Eliminations begin at 8 a.m. Top Alcohol Dragster and Top Alcohol Funny Car qualify at noon & 4 p.m. Harley Series Qualify at 12:45 and 4:45 p.m. Top Dragster, Comp Eliminator and Top Sportsman start eliminations at 1:30 p.m.
SUNDAY, Nov. 9- Gates open at 7 a.m. Eliminations continue at 8:30 a.m. Eliminations for Top Alcohol Dragster, Top Alcohol Funny Car and Top Fuel Harley are at 11:00 a.m.
GENERAL ADMISSION/PIT PASS - $20 Friday, $20 Saturday, $20 Sunday. Children 6-12 years old are $5 each day. Children 5 and under are free with paid adult. For more information please call Las Vegas Motor Speedway, (800) 644-4444 or visit www.LVMS.com. Jim Whiteley, Top Alcohol Dragster; Ann Whiteley, Top Alcohol Funny Car; Alan Ellis, Comp Eliminator; Justin Lamb, Super Stock: Jimmy DeFrank Jr., Stock Eliminator; Gary Wamboldt, Super Comp; Clint Fishel, Super Gas; Brad Vinje, Super Street; Ted Cali, Top Sportsman; Mera Silvia, Top Dragster; Sean Conner, Sportsman Motorcycle. NHRA LUCAS OIL DRAG RACING SERIES POINTS FUND: a $519,000 point fund from Lucas Oil, which will be shared by 2014 NHRA Lucas Oil Drag Racing Series divisional, regional and national champions. Regional awards include $10,000 each to the Top Alcohol Dragster and Top Alcohol Funny Car champions with Divisional awards of $3,000 to the champions in both Competition and Super Stock; $2,000 each to the champions in Stock, Super Comp, Super Gas and Super Street. The seven national champions will share a bonus of $135,000. JEGS ALLSTARS: The best of the best from each of NHRA's seven divisions will compete for a share of the $124,000 point fund from Jegs High Performance. The 2014 Jegs Allstars event will culminate a year-long points battle between drivers in each of NHRA's Lucas Oil Drag Racing Series' eight classes as well as Top Sportsman and Top Dragster. The top points earner in each category will qualify to represent his/her division at the 2014 Jegs Allstars. Points are based on in-division races only. The winning regional and division teams will share $25,000 and individual awards include $7,000 each to the Top Alcohol Dragster and Top Alcohol Funny Car champions, $6,000 to champions in Comp Eliminator and Super Stock, $5,000 to Top Sportsman and Top Dragster champions, and $4,500 to the Stock, Super Comp, Super Gas, and Super Street champions. Runners-up in all categories will earn $2,000 apiece. Each Allstars competitor will also receive a share of a $25,000 towing fund to get to the event. Event sponsor, Jegs High Performance, is offering a "double up" bonus to Jegs Allstars participants. Any 2014 Jegs Allstars champion who also wins the national event will have his/her Allstars prize doubled. NHRA SPORTSMAN MOTORCYCLE SERIES presented by HARLEY-DAVIDSON: The NHRA Sportsman Motorcycle Series presented by Harley-Davidson, run in conjunction with the NHRA Lucas Oil Drag Racing Series, is an opportunity for competitors in NHRA's Sportsman Motorcycle class to earn points toward divisional championships. The $14,000 champions' purse posted by Harley-Davidson will be paid to 1st, 2nd, and 3rd place points finishers in NHRA divisions that host Sportsman Motorcycles. 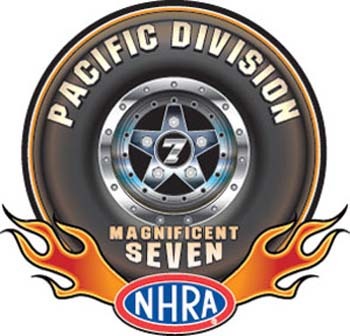 PACIFIC DIVISION TOP SPORTSMAN SERIES: The Pacific Division Top Sportsman Series, runs in conjunction with the NHRA Lucas Oil Drag Racing Series, is an opportunity for competitors in the Pacific division's Top Sportsman class to earn points toward divisional championships. The $3,500 champions' purse will be paid to 1st, 2nd, and 3rd place points finishers. PACIFIC DIVISION TOP DRAGSTER SERIES: The Pacific Top Dragster Series, run in conjunction with the NHRA Lucas Oil Drag Racing Series, is an opportunity for competitors in the Pacific division's Top Dragster class to earn points toward divisional championships. The $3,500 champions' purse will be paid to 1st, 2nd, and 3rd place points finishers.